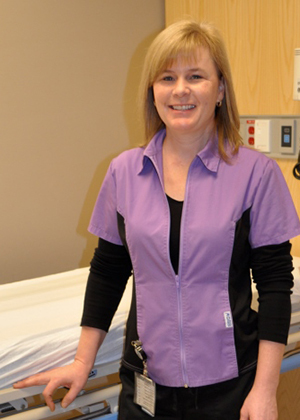 Christine began participating in de Souza courses as a way to supplement her experiences working as a radiation oncology nurse at the Simcoe Muskoka Regional Cancer Centre of Royal Victoria Health Centre in Barrie. After completing over 4 credits in the learning domains of practice as well as completing a 75-hour clinical fellowship with the Princess Margaret Cancer Centre and SMRCC; she has earned the title of ‘de Souza Nurse Designate’. When completing her designation, her goal was to promote a holistic approach to cancer care and bring in a survivorship model to facilitate high quality care for patients and families. Christine approached her clinical fellowship with clear goals in mind; to expand her knowledge in the management of radiation related side effects, to broaden her understanding of the Nurse Navigator role and to take part in a survivorship model to enhance the care she provides to the families and patients she supports on a day-to-day basis.